What were the Boundary Stelae? These were markers placed around the city of Akhetaten, thought to show the limit of the city (and also presumably to make sure that no other gods were allowed within the boundaries). New thoughts on the layout of Akhetaten also show that that the placement of these stelae were not haphazardly done - the alignment matches very closely with the city and more importantly the tomb of Akhenaten. 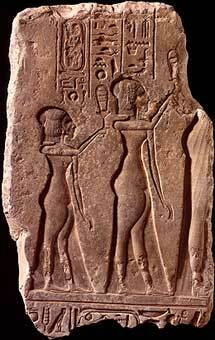 (copy of the upper part of Stela S, and shows Akhenaten, Nefertiti and their two eldest daughters worshipping the Aten). 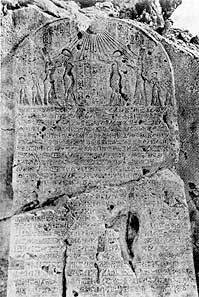 The inscription of one such Boundary stela - the king and queen are seen in the upper compartment, raising their hands in an attitude of prayer to the Aten, whose disk shines over their heads - each ray of light terminating in a hand giving life. Two royal daughters, Meritaten and Mekaten, accompany the King and Queen. The stela also records a date: 6th Year in the month of Pharmuthi, the 13th day. 'On this day was the king in Akhetaten, in a tent of byssus. And the king - life, prosperity and health to him! - changed Akhetaten, which was its name, into Pa-aten-haru ('the city of the delight of the Sun's disk'). And the king appeared riding in the golden court-chariot, like the disk of the Sun, when it rises and sheds over the land its pleasant gifts, and he took the road that ends in Akhetaten, from the first time when the king had discovered it, to found it (the city) as a memorial to the disk of the Sun, according as the Sun-god king, who dispenses life eternally and for ever, had signified to him to found a memorial within it. A proper and complete sacrifice was offered on that day in the [temple of the sun] at Akhentaten, to the Sun's disk of the living god, who received the thanks of the love of the royal counterpart, the Pharaoh Akhenaten. Thereupon the king went up the river, and went up in his chariot before his father, the Sun-god king, towards the mountain to the south-east of the city of Akhetaten. The beams of the Sun's disk shone over him in a pure life, so as to make his body young every day. 'What I swear is a true avowal of that which my heart says to me. Never is there falsehood in what I say'. With regard to the southern memorial tablet, [of the] four [memorial tablets] on the east of the city of Akhetaten, let this be the memorial tablet which I will have set up in the place which I have chosen for it in the south, for ever and eternally. This memorial tablet shall be set up in the south-west towards the middle, on the mountain of Akhetaten, in the midst of it. With regard to the memorial tablet in the middle, on the mountain to the east of the city of Akhetaten, let this be the memorial tablet for Akhetaten. This I will have set up in its place [which I have appointed for it in sight of] the city of Akhetaten, at the place which I have appointed for it in the east, for ever and eternally. This memorial tablet in the middle, on the mountain to the east of the city of Akhetaten, let it be in the midst of it. With regard to the memorial tablet to the north-east of Akhetaten, I will have it set up in its place. Let this be the place which I have appointed for it'. The following lines have been so damaged that very little more can be made out except that the king also set up a similar boundary stela to the west of Akhetaten on the opposite bank of the river. 'This memorial tablet, which was placed in the middle, had fallen down. I will have it set up afresh, and placed again at the place at which it was [before]: this I swear. In the 8th Year, in the month Tybi, on the 9th day, the king was in Akhetaten, and Pharaoh mounted his court-chariot of polished copper, to behold the memorial tablets of the Sun's disk, which are on the hills in the territory to the south-east of Akhetaten. The phrase 'fallen down' has been taken to mean that this stela (and others which had similarly fallen down) had been destroyed by the Egyptians themselves disaffected with Akhenaten and his religious beliefs. 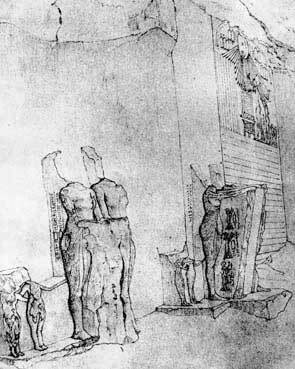 Pencil drawing made by Robert Hay in 1827 of Boundary Stela A, which once again shows Akhenaten, Nefertiti and their two eldest daughters making offerings - the figure of a third daughter had been added to the infill (and was therefore carved after Stela S above).